Feb 13, 2017; Salt Lake City, UT, USA; LA Clippers forward Blake Griffin (32) shoots the ball against Utah Jazz center Rudy Gobert (27) during the first half at Vivint Smart Home Arena. With or without Chris Paul, L.A. won’t be so easy to top in the Western Conference playoff shuffle. 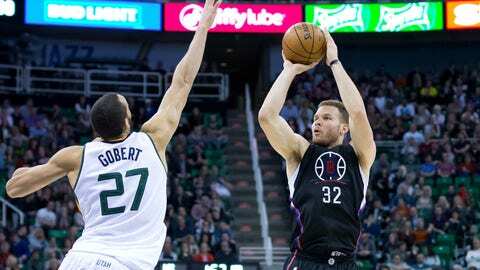 Blake Griffin had 26 points, 10 rebounds and six assists, Austin Rivers had a strong second quarter and Los Angeles rolled over Utah 88-72 on Monday night. “For three quarters, it was as good as we could play with this group,” Clippers coach Doc Rivers said. “I thought our defense was lively and on point. Paul sat out with a left thumb injury, but the Clippers still controlled the game while the Jazz had a lousy shooting night. DeAndre Jordan brought the energy early, then Austin Rivers got hot in the second quarter before Griffin had a dominant 12-point third quarter. Jordan finished with 10 points and 13 rebounds, and Rivers had 15 points. Utah shot 33 percent from the field and 20.8 from 3-point range — both season lows. The Clippers led by 28 in the third quarter following a 19-4 run. “They had a lot more resolve in their defensive end than we did on our offensive end,” Jazz coach Quin Snyder said. “If we were to make a couple shots, it would have just masked the fact that we didn’t have any toughness on the offensive end in order to execute. Rudy Gobert had 10 points and 14 rebounds for Utah. The Clippers took a half-game lead over the Jazz for the fourth spot in the Western Conference standings. Los Angeles led 45-34 at halftime following a 12-point first half from Rivers. The guard entered averaging 12.1 points per game. Utah looked disjointed on the offensive end from start to finish. A 17-4 second-quarter spurt highlighted by Jordan’s alley-oop dunk and a pair of 3-pointers by Rivers pushed the lead to double digits. Clippers: Los Angeles has won nine straight games in Salt Lake City dating back to 2012. … The Clippers concluded a stretch with 10 of 11 games on the road. Jazz: Rodney Hood missed his sixth straight game due to a lateral collateral ligament sprain and right knee contusion. He was re-evaluated Saturday night and is expected to return after the All-Star break. … The last time the Jazz scored fewer than 72 points was 69 against the Spurs on Jan. 18, 2015. Rivers said the first-time All-Star does that every game. Snyder called the game a barometer for his team before tipoff. It was not a good night to use the Clippers as a measuring stick. Clippers: Los Angeles hosts Paul Millsap and Atlanta on Wednesday night in its last game before the All-Star break. Jazz: Utah hosts Damian Lillard and Portland on Wednesday night before going on break.